Great Opportunity with NO HOA within walking distance to downtown Jaco Beach. 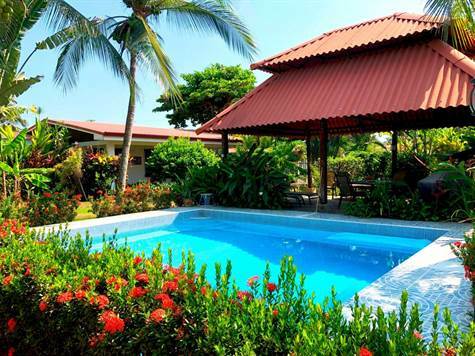 Comfortable three bedroom two bathroom house currently used as a vacation rental. Large outdoor rancho adjacent to pool perfect for outdoor entertaining and BBQs. Nice sized lot with room to add on. Ideally located in the popular Ricos y Famosos neighborhood within walking distance to restaurants, shopping, and nightlife. This home is close to all amenities and fenced for complete privacy.